Psoriasis on the neck and scalp often occurs simultaneously. The reasons for this condition have not yet been revealed. There may be such varieties of pathology as teardrop, seborrhoeic and pustular (with generalized form of the disease) psoriasis on the neck. Often inflammation of the epidermis in the neck is accompanied by seborrheic psoriasis. This greatly complicates the treatment of the patient. 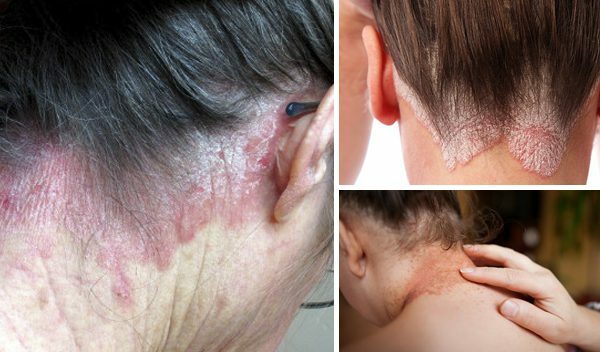 With psoriasis on the neck, there is a high risk of its spread to the skin of the face, eyelids and scalp. At the initial stage, psoriasis on the neck and head causes no discomfort. It looks like small bumps on the skin. There are no itching or peeling. But gradually the inflammation grows, the areas with bumps become bright red, and then – white. Then, from the affected areas, the skin scales begin to lag behind. This is accompanied by severe itching and pain. Scratching leads to wounding and bleeding. “bloody dew” – pinpoint bleeding after removal of scales. If there are such symptoms on the neck, you should immediately consult a doctor. The doctor determines the presence of the disease with an external examination. 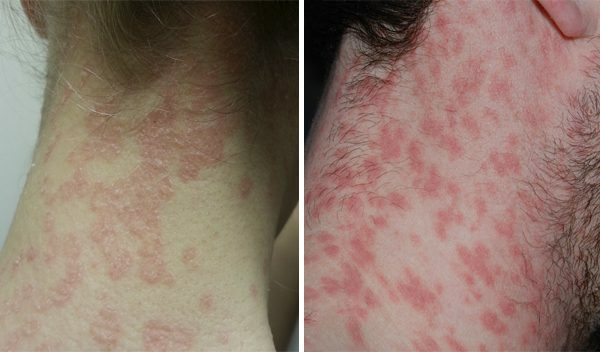 A variety of psoriasis at the initial stage is rather difficult to diagnose. But it can make an experienced dermatologist. For differential diagnosis, the patient is assigned a biochemical blood test, urine and feces analysis. A tissue biopsy is also performed to identify pathogenic microorganisms, the alleged causes of psoriasis and other data. The patient necessarily needs systemic treatment of psoriasis. In his absence, complications may develop.